Zakynthos or Zante is a Greek island in the Ionian Sea. It is the third largest of the Ionian Islands. Zakynthos covers an area of 405.55 km2 and its coastline is roughly 123 km in length. In Greek mythology the island was said to be named after Zakynthos, the son of a legendary Arcadian chief Dardanus. Zakynthos is a well known destination, with an international airport served by charter flights from northern Europe. The island's nickname is "The flower of the Levant", bestowed upon it by the Venetians who were in possession of Zakynthos from 1484–1797. The mild, Mediterranean climate and the plentiful winter rainfall endow the island with dense vegetation. The principal agricultural products are olive oil, currants, grapes and citrus fruit. The Zante currant is a small sweet seedless grape which is native to the island. The Bay of Laganas is the site of the first National Marine Park and the prime nesting area for loggerhead sea turtles (Caretta caretta) in the Mediterranean. •	Enjoy absolute relaxation in Zante, but you can head into busier Zante resorts if you want a bit of a holiday buzz! •	Enjoy evening entertainment, including traditional Greek dance, bouzouki and song. Traditional Zakynthian serenades, known as “Kantades” provide really special evening entertainment, in selected locations around the island. Famous landmarks include the Navagio beach, a cove on the northwest shore isolated by high cliffs and accessible only by boat. Numerous natural "blue caves" are cut into cliffs around Cape Skinari, and accessible only by small boats. Keri, on the south of the island, is a mountain village with a lighthouse. The whole western shore from Keri to Skinari contains rock formations including arches. Northern and eastern shores feature numerous wide sandy beaches like Gerakas Beach and St. Nicholas Beach. The largest resort is Laganas. Marathonissi islet (also known as "Turtle Island") near Limni Keriou has tropical vegetation, turquoise waters, beaches, and sea caves. Bochali hill above the Zakynthos town contains a small Venetian castle. Undeniably, there is no greater figure in Zakynthian and perhaps Greek literature than Dionysios Solomos (1798–1857). He is best known for writing the 158 stanza Hymn to Liberty in 1823, which was inspired by the Greek War of Independence of 1821. Other notable poems by Dionysios Solomos include Τhe Cretan, Lambros, The Woman of Zakynthos and perhaps his masterpiece, The Free Besieged. Interestingly, no poem except Hymn to Liberty was completed, and almost nothing was published during his lifetime. Solomos also wrote prose and poems in Italian. A public holiday was declared on the day of his death. A statue of Dionysios Solomos sits in Solomos Square, Zakynthos. 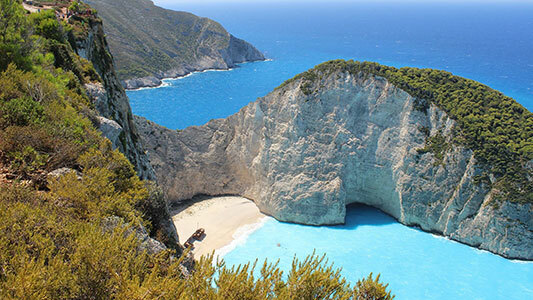 Why choose Zakynthos for your holiday? Zakynthos provides an ideal holiday location in the Greek Islands for all ages. Away from the hectic pace and responsibilities of everyday life at home, you'll find that the natural beauty of Zakynthos will provide great energy for reviving body and soul. The Greek island of Zakynthos is an artists’ paradise. The weather in Zakynthos consists of a typical Mediterranean climate. Zakynthos is one of the sunniest islands in Greece. Rain in the summer season in Zante is rare. Zakynthos is considered to have one of the highest sunshine hours in Greece and the Mediterranean, which makes it an ideal location for beach weddings, and for those who want to go abroad to get married in the sun. In Zakynthos during the winter, not only is the rainfall quite high, but so is the level of humidity, which explains the rich fertility of the land in Zakynthos, along with the lush green forests and vegetation, covering many parts of Zante island. Found out more about the island in "Explore Zakynthos" website. We are waiting for you ….. To offer you the Time of your Life!